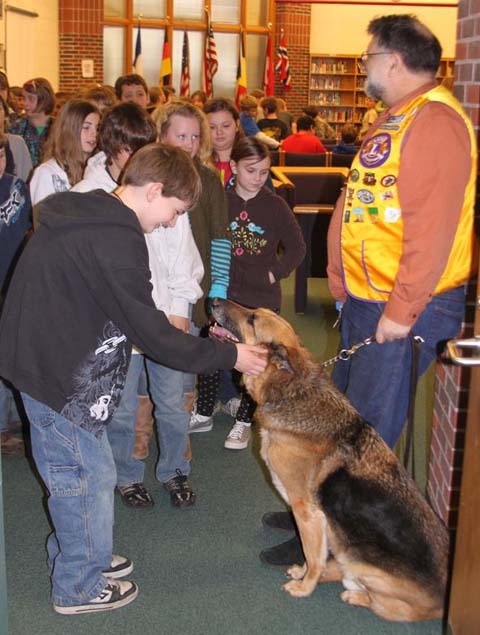 MANISTEE -- He is an eight-year outstanding veteran of his profession, and his big brown eyes slowly surveyed the room full of Onekama Elementary students with great interest on Wednesday morning while his �boss� filled them in on what his important duties were to help him lead a more productive life. No, it wasn�t an employee listening to his employer talk. It was a case of a 10-year-old German Shepherd Leader Dog named Ranger listening to the voice of his master, Tom Silverthorn. 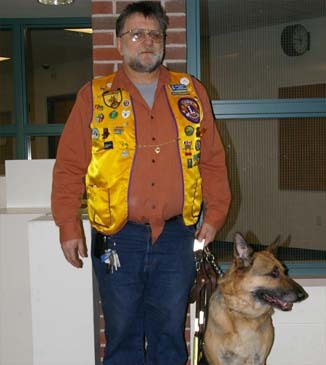 Being vision impaired put a challenge in Silverthorn�s life, but he has been able to live a better life with the assistance of Ranger for the past eight years. 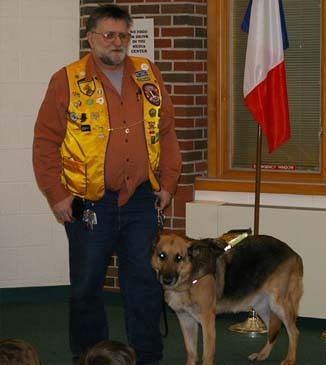 The gift of Ranger has made Silverthorn so appreciative of the Leader Dog Program that for the past several years the former Manistee County resident pays his own way back from his present home in South Dakota every year to take part in the 4-H Leader Program in the schools. 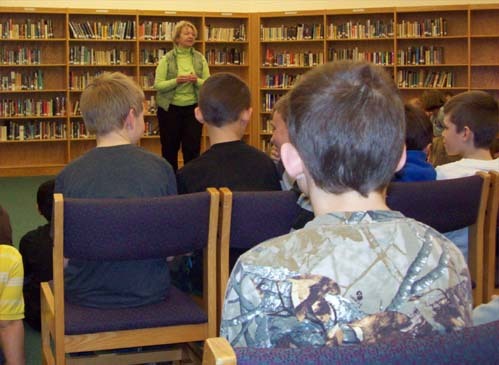 It is something that Manistee County 4-H Program�s Deb Laws said is priceless. "It is really a labor of love, as he pays for his own trip and hotel," said Laws. "About the only thing we do for him is pay for a lunch. 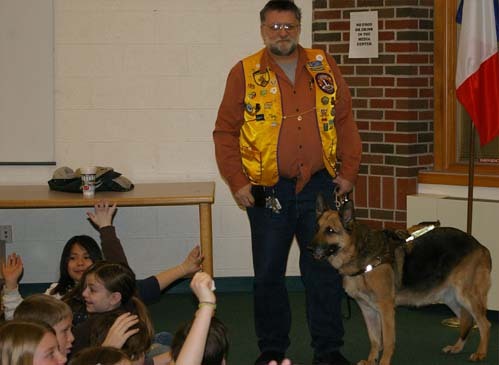 "Silverthorn agrees that he wouldn't miss the program for anything, and looks forward every year to showing the children all the thing that Ranger does to assist him on a daily basis. �In the past two years, I have paid $2,000 of my own money to come up her, but it is worth it,� said Silverthorn. 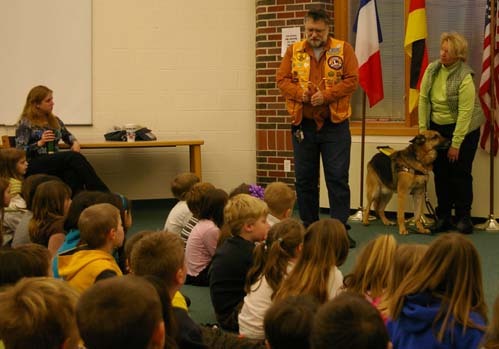 Laws, Silverthorn and several other people instrumental in the local leader dog program have been making the rounds to the elementary schools in the county to point out the importance of the program. Wednesday�s inclement weather prevented several of the people involved in the program from traveling to Onekama Schools, but Laws, Silverthorn and Ranger were able to keep the program going. Laws took the students down the path a puppy like Ranger follows when they become candidates for the Leader Dog program. It is a path that begins at a very young age for the puppy. �When they are six weeks old, we place them with a family,� said Laws. �They are instructed to take them out among people so they are not afraid of anything. We tell them to �take that puppy with you� because we want them exposed to things in every way possible. They are also instructed to teach the puppy to behave. Laws said dogs have all kinds of useful purposes they can serve if they don�t make the cut for the Leader Dog program. She said they are capable of becoming therapy dogs, and they even had one dog that went into a very interesting line of work. 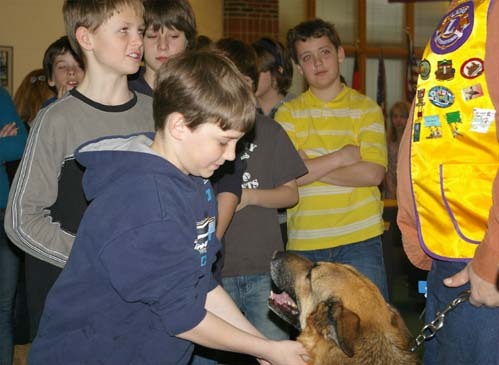 Silverthorn told the students that when Leader Dogs like Ranger are working, they shouldn�t come up and try to pet them because it distracts the dog from its task. He said it is best to always ask the owner first if it is allowable to pet the dog. Today we went to the leader dog thing it was fun. The litttle kids were being a little loud. The dogs name was Ranger and the man's name was Mr. Tom They usually get the dogs when they are puppys. They are usually two years old when the people get them. Ranger is already 10 years old, so he is the same age as my uncle and aunt's dog Bear. We had a lot of fun and learned a lot of things. 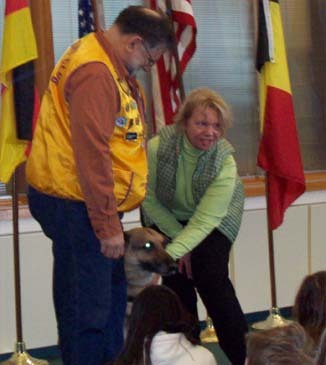 We went to the Leader Dogs thing in the Media Center about Mr. Tom and Ranger his Leader Dog, He talked to us about having a Leader Dog and how important it is to have a dog. He told us that if Ranger and he were at Olson's then you have to ask him if you could pet him and if you would pet him you could not pet him on the head because then he would be distracted so you all ways have to pet a Leader Dog on his neck so he is not distracted by you. ~Katelynn F.
Today we got to meet a leader dog named Ranger. If you meet a leader dog you should ask the owner if you can pet the dog. Then pet them on the neck. You don't want to pet them on the head because they will get calm and they won't be doing their job. Leader dogs usually are for people that are blind so they know where there going. If you want to meet a leader dog you can see a leader dog at Olson's. Then when it was time to go every one got to pet Ranger!! I like Ranger he was very nice. ~Carlee P.
Today we went to the library and saw a leader dog. His name was Ranger. There were suppose to see other ones but they didn't come because of the weather. The weather was bad. This my second year seeing the leader dogs. The dogs owner was Mr. Tom. He was kind of blind. So Ranger helps him walk. I want a dog like that. Ranger was a German Shepard. At the end we got to pet him. 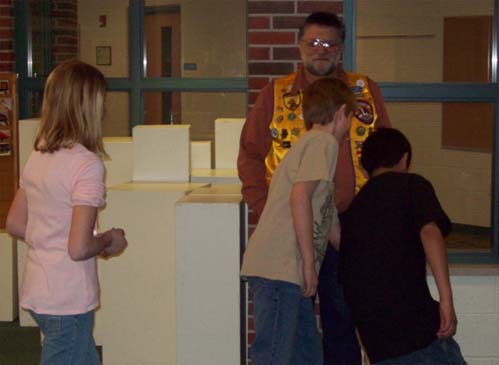 Mr. Tom also showed us how Ranger led the way for him. It was awesome! ~Caleb M.
The leader dog presentation was really good! It was sad that the other dogs did not get to come. The dog that was there named Ranger was really cute! I'm glad that there are dogs that can help peope in need! 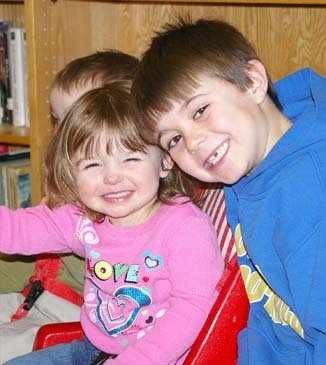 I think the kids had a good time. The best part was when we left the room we got to pet Ranger. I loved the presentation. When we met Mr. Tom he was nice. He talked about his dog Ranger. Ranger is so cute! 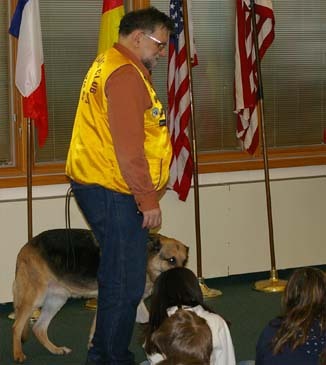 when i first went in to the library to sit down and listen to him talk i thought to myself what a cute dog and when it was over all of us kids got to pet Ranger. It was cool. Then when i got to pet Ranger and i walked away from him i was like awwww i want that dog because it was so cute. ~Kaylynn R.
I think that the leader dogs are cool, because they help people. Mr.Tom and ranger came in to show us what it is like to have a Leader Dog and tell us thing about Ranger's Job. I liked that Mr. Tom and Ranger came in. ~Elizabeth D.
At the Leader Dog Presentation Mr.Tom got Ranger to show us some stuff Ranger can do. Mr. Tom said find the door and then Ranger came to me and Katelynn and, then he found the door it was so much fun at the Leader Dog. ~Ashton H.
On March 3, 2011 my class and I learned about leader dogs. Sadly only one of the dogs could come because of the storm. His name was Ranger and his owners name was Tom. They talked to us about Ranger and of course other leader dogs. I learned a lot! ~Emily B. Today we went to see the leader dogs of Manistee. Except there was one problem only one came because of the weather. the dog's name was ranger and the owner's was Mr. Tom. Mr. Tom was really nice. He had Ranger for eight years. At the end we got to pet Ranger. He licked my nose too! I had a great time. ~Madison M.
I had fun at the leader dog thing. I got to pet the dog Ranger. It was fun. ~Maximillian H. We saw a blind person's dog today. The dogs name was ranger and the leader was Tom. Tom showed us what rangers job was. ~Jared S. Today we got to meet a leader dog named Ranger. We got to pet him on his neck. And if you meet a leader dog you have to ask if you want to pet him on the neck. I thought it was nice of them to bring him in! ~Maia R..
Additional 3rd grade writings Leader dogs are good with people. Mr. Tom owns Ranger. They talked about Ranger and talked about how Ranger got here and when Mr. Tom got Ranger. Mr. Tom got Ranger at age 2.They have lots of different kinds of leader dogs. ~Dylan J.